Have you ever entered a surname into a search engine bar and noticed that one or more of your hits was for findagrave.com? 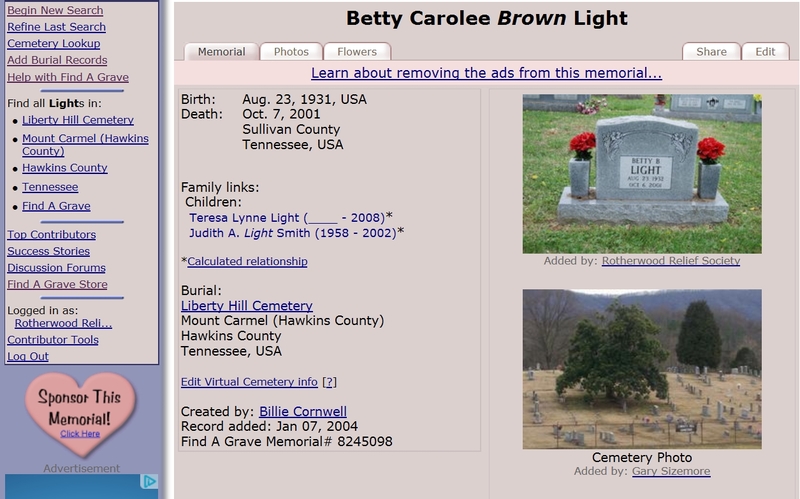 Have you ever gone to the site and used findagrave.com’s own search tools? Doing so can bring forth surprising results for the genealogist. 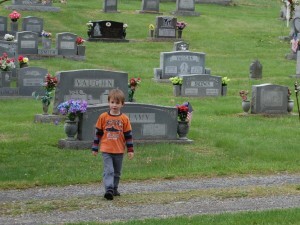 Findagrave.com provides a free database of cemeteries, tombstone photographs, and biographical information of deceased individuals. All of the content is created by volunteers. 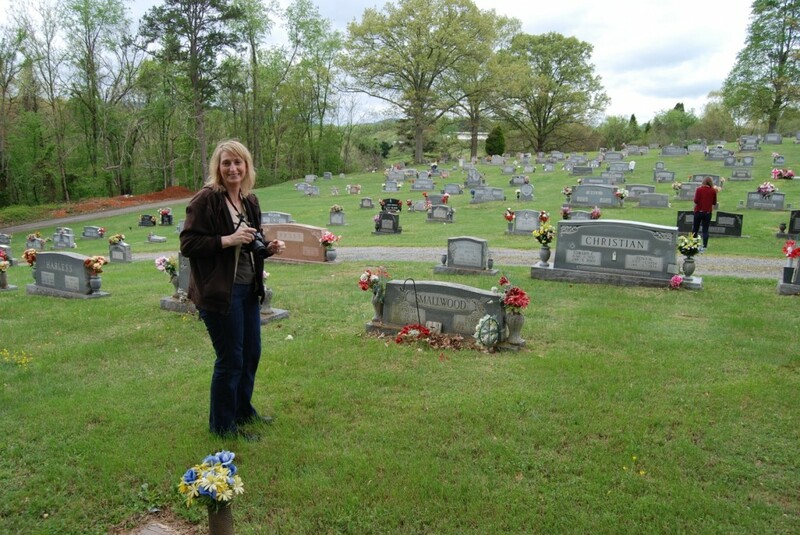 I have been wanting to become a findagrave.com volunteer since the fall of 2013 when I read a Society of Tennessee Archivists newsletter article (page 8) by Naomi Billings about the volunteer efforts of her retired father. He has photographed thousands of graves for the site. He does this in his own community but also as a part of his travels. I found his story very inspiring. Last week, I finally put the desire to become a volunteer into action at the encouragement of a church friend. Four of us descended upon the Liberty Hill Cemetery in Mt. Carmel, Tennessee and made a morning of it. We took about 600 photographs in 75 minutes. So far, 389 photos have been loaded onto the site and 238 individual memorial pages have been added. We fulfilled two photo requests by users of Find A Grave. Before we arrived at the cemetery 64% of Liberty Hill had been photographed. Now, 76% has been photographed. Those are pretty satisfying statistics and we are not even finished, yet!. Here is how we did it. 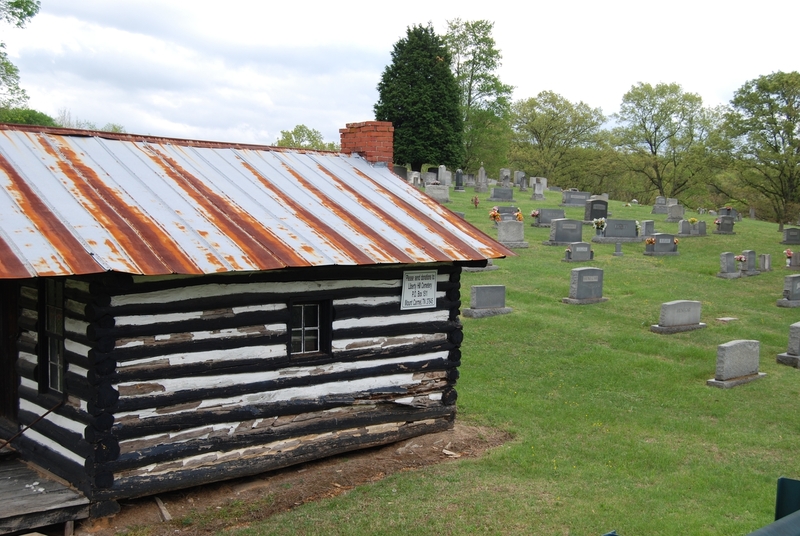 Locals will recognize the entrance to the cemetery from this rustic-looking utility cabin. 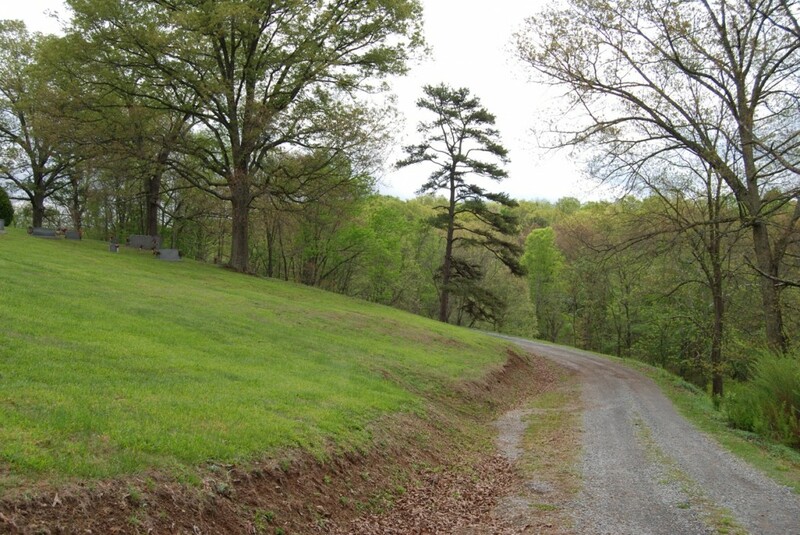 Liberty Hill Cemetery literally sits on a small hill in Hawkins County, Tennessee, adjacent to the main highway 11w. It’s park-like setting is circumferenced by a horseshoe shaped drive. This is the backside of the drive, or the apex of the horseshoe. When we got closer to the exit, we parked our vehicles and made our plan. We decided to attempt to photograph the one section of the cemetery outside of the horseshoe drive and the first few rows of the main center section. We photographed every stone and marker without making a list from the site of what had and what had not been photographed. The only list we made was comprised of the 8 names for which there were photograph requests registered. If you live in a different part of the country from where your ancestors are buried, you can register for free by creating a username and password. Then, as a registered user, you can request photographs to be taken by volunteers living near the too-distant cemeteries, as well as add content to current or new memorial pages. We referred to these 8 names often and ended up crossing two of them off of the list. Here is what the page for Liberty Hill Cemetery looked like before we started. 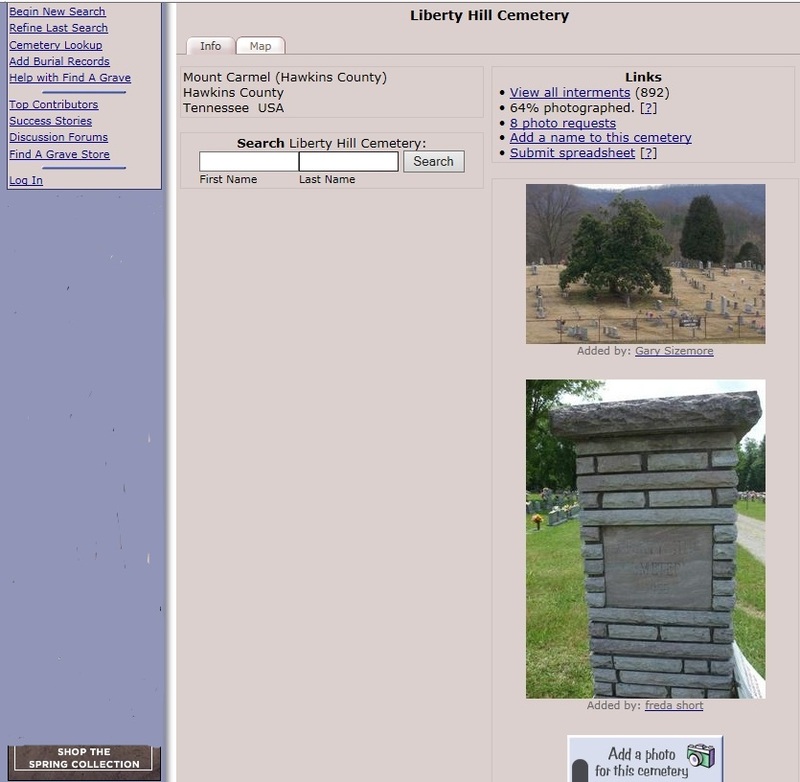 A screen shot of the Liberty Hill Cemetery page on findagrave.com. As you can see above, each cemetery page has its own search bar into which a user can enter a name to see if either their ancestor has been photographed already or if, as a volunteer, the photographs you’ve taken need to be added or discarded as duplicates. My favorite markers to read were for military service. As a genealogist, I found these to be so informative. Not only do they give a name and vital statistics, but often the branch of service, rank achieved, and possibly the wars in which the individual fought. Here is a picture of one of my friends firing away. My daughter Anna’s iPhone took amazingly high quality photographs that loaded up to the site perfectly. The fourth volunteer was Ella. She is the Find A Grave pro who put the whole outing into motion. We decided to create a new group registration separate from Ella’s or my usernames so that future outings by this group can all be loaded up under the same name. Here is what the memorial page looks like for one of the photo requests we fulfilled. I was recently contacted by ‘Kathy’ who had found my findagrave memorial for my husband’s g-grandfather. During the 1960’s, Kathy’s grandmother had purchased a picture frame at a yard sale in Texas. When she opened the frame to remove the picture there was a marriage certificate in the back of it for Ogden Christy and Martha Bacon from Philadelphia, dated 1877. Kathy’s family kept the document for over 50 years hoping to return it to the family it belonged to. She found me . . . . thanks to findagrave. Words cannot express my appreciation. 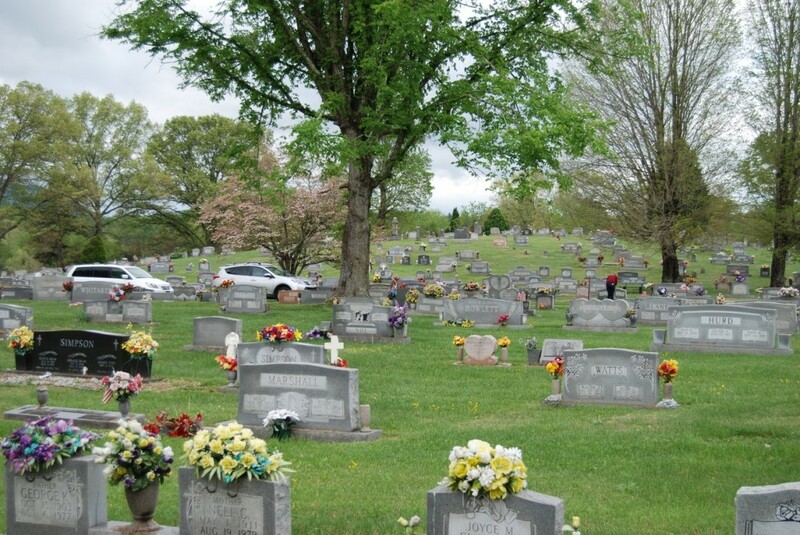 I have been a member of findagrave for over eleven years. I have appreciated having a place to keep all of my ancestors death and burial information, and being able to share it with other researchers as well. I had no idea this miracle would be the result. Thank you! How great is that story? There are many ways Find A Grave can be used in your research. It can help you connect to others researching your lines and it can help you discover where an ancestor is buried. The photograph of a tombstone might provide you with vital information not currently in your records or might serve as a confirmation of information you already have. Also, useful insights can sometimes be gained by reading the stones of others that once lived in your ancestor’s community. Here is the marker for my great uncle Emile Carrier. I did not know until today that his middle name was Joseph, but thanks to the kind contributor “Lucy,” now, I do. Saint John’s Cemetery. Rumford, Oxford, Maine. Thank goodness the picture was taken when it was. As you can see, the stone is beginning to break. That is another wonderful thing about Find A Grave. As the story of Naomi and her father demonstrates, it encourages people to document their local cemeteries before erosion and time erase the stones and interested generations who took care of them pass away. 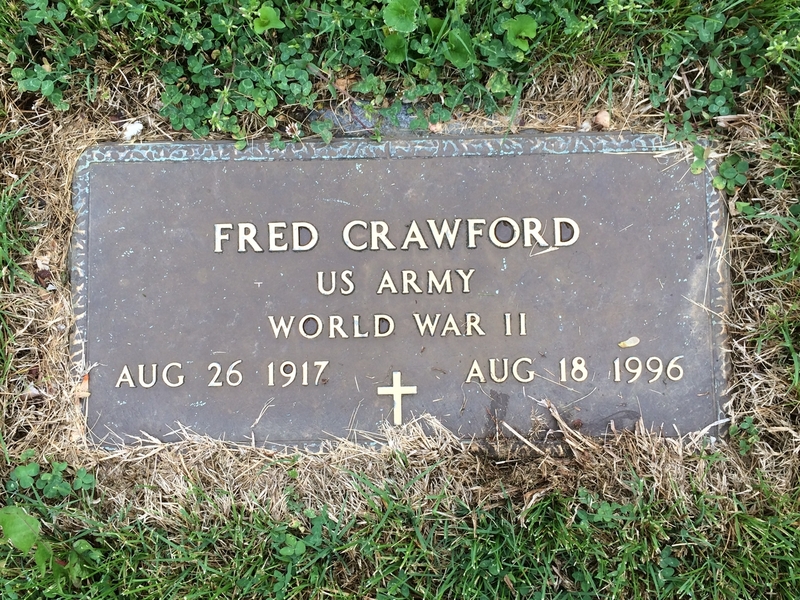 I found the findagrave.com interface extremely intuitive and user friendly. There is an extensive FAQ that answers any question a new user might have. Also, I did not have to reduce the size of the photographs taken with my high resolution digital slr. The site can “take it” and that saved me a lot of time! Commercial break! 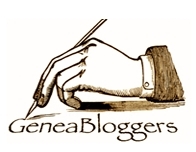 I need to thank a few groups and individuals who have been supportive of my blog. Archiventures is currently listed on four blog rolls and this is not only helpful, but encourages me to keep writing. THANK YOU to . 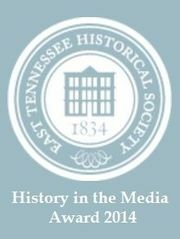 . .
Tonight, I am attending the annual meeting of the East Tennessee Historical Society where I am receiving the History in the Media award. More on that, later, but a big thank you to the ETHS for their support, too! Wilton, our mascot for the morning. 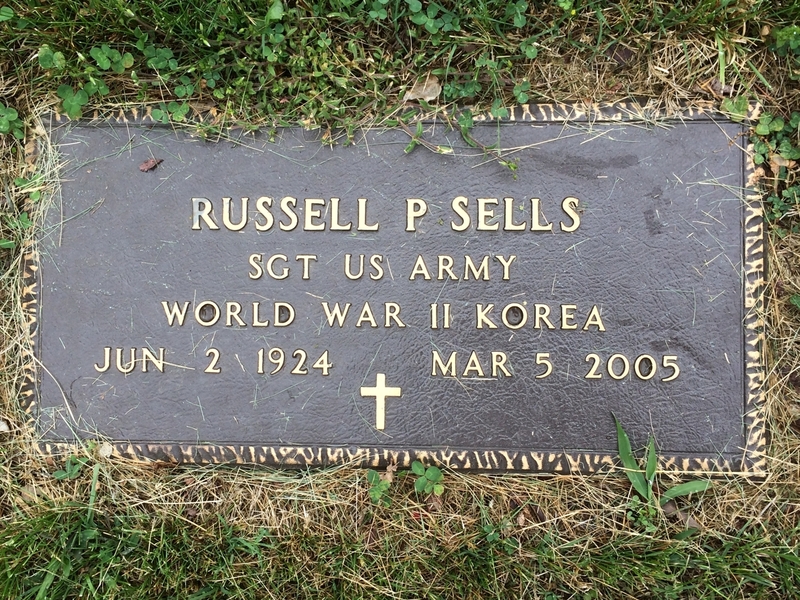 This entry was posted in Genealogy and tagged Carrier, cemeteries, Find A Grave, genealogy, volunteer. Bookmark the permalink. Wow, I went on google to find a copy of my article only to first find your reference to it in your blog here. 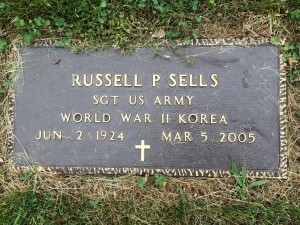 I’m so inspired that my article about my dad encouraged you to volunteer for findagrave.com. They’re absolutely a fantastic group of people like you who help others. So, in short, thank you! How do you go about finding cemeteries that need photographing or, if one was started, what portion has been completed? My son and I love cemeteries, and he’s a great photographer. This sounds like something we would enjoy doing together. Thanks! Tammy, as you probably already know, many small cemeteries do not have signs announcing their names. What I do is take a little camera or phone with me to a small, local cemetery and photograph a few headstones. I often do this when I am on bike rides. 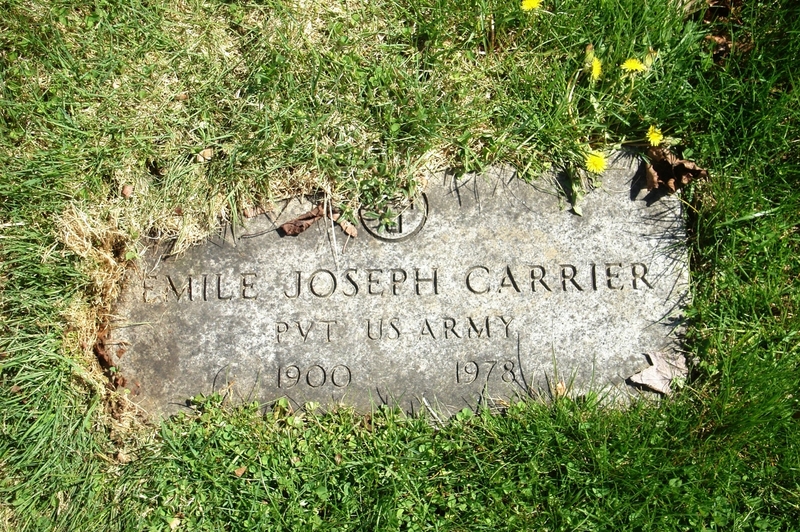 Then, on findagrave.com, I enter the name and dates into the search engine. If I get a hit, this is a pretty convenient way to find out the name of the cemetery and what percentage of it has been uploaded. If you are a tech-ie type, you can just stand in the cemetery with your ‘smart’ phone and look up a few headstones right then and there. If you find a cemetery that has been started but not completed, like we did with Liberty Hill, you can click on “view all internments” to see what has been recorded, or you can take pictures, first, load them up to your computer, and use the cemetery search bar to see if they are needed or not. 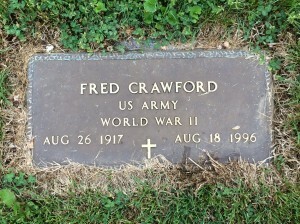 You must be a registered user to make a contribution on findagrave.com. Use their FAQ for more ideas about how you can help in your area. Great write-up on Find A Grave. I love being part of this with you! Wow, what a neat organization! I have so many pictures of cemeteries throughout Utah. (Mostly my own family.) I may just have to put those pictures to work! I so wish I could attend and be a clapping Kari Roueche fan tonight! I agree with BarDee, you deserve this recognition. Your site is outstanding! Keep up the writing Kari! Congrats Kari, You do such good work. You deserve every bit of it.